What is another word for scrupulous? 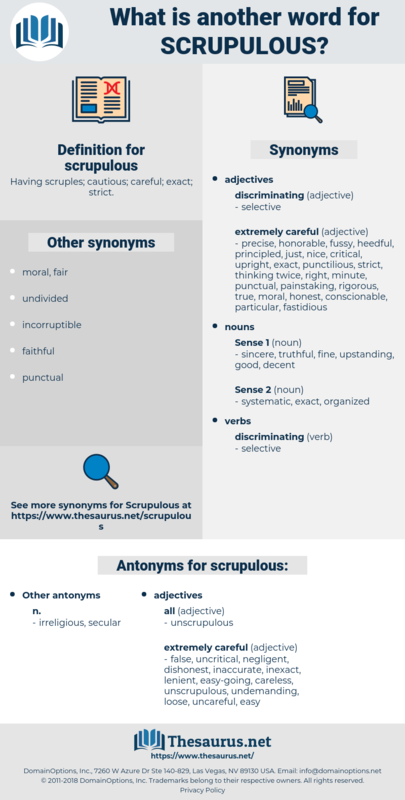 Having scruples; cautious; careful; exact; strict. thorough, stringent, precise, faithful, accurate, painstaking, detailed, serious, prudent, cautious, delicate, flour, exact, attentive, tight, full, conscientiously, diligent, exacting, tough, close, earnest. meticulous, rigorous, conscientious, strict, vigorous, rigid. negligent, loose, easy-going, inexact, uncritical, careless, false, dishonest, easy, lenient, undemanding, uncareful, inaccurate. neglectful, unguarded, indecent, debased, depraved, mindless, slovenly, regardless, dissolute, imprecise, halfhearted, perverted, infamous, indifferent, unsafe, lackadaisical, corrupt, undiscriminating, lazy, unwary, degenerate, debauched, impetuous, inattentive, untrustworthy, bold, cursory, incautious, evil-minded, rash, reprobate, unreliable, slipshod, reckless, immoral, heedless, unjust, mean, sloppy, atrocious, apathetic. The word " have," which should naturally have followed, was more than he, the scrupulous business man, would allow to pass his lips so lightly. And so they may Panthea, so will we, And kiss again too; we were too scrupulous, And foolish, but we will be so no more. surplus, scruples, surplusage, square block, serflike, surplice, scrofulous.